The holiday season brings with it a spirit of joy and goodwill, special traditions such as decorating trees and decorating cookies, fun activities like caroling and gift-giving, Neopets specials like the Advent Calendar and Stocking Stufftacular, and (let's not forget) a lot of spending and a lot of stress! Whether you spend the holidays full of good cheer or full of anxiety, one thing that's sure to catch your eye this season is the fabulous fashions of Christmas. As far as painting pets goes, the Christmas Paint Brush is relatively cheap (especially considering it often includes clothes), and Christmas looks are available for 48 species of pet while this article is being written. But who has the most wonderful winter wear? Over 200 users voted for their favorite festive fashions, and the top ten pets of the season are about to walk the winter wonderland runway for your viewing pleasure. So take off your coat, grab a cup of hot chocolate (or starberry cider or maybe some neggnog), find a seat by the fireplace, and get ready for a jolly good time! First up is the Bori, a Terror Mountain native with a penchant for cold weather and a warm heart. The Christmas kind is equipped with a natural, thick, white coat perfect for blending in with his winter environment to hide from snowball-toting friends or rogue Xamphers. And if there's not enough time to dig a tunnel with his snow-white claws, he can always try hiding in a Red Holly Bush, since the green tips of his ears and the holly sprig on his green-furred tail would blend in nicely. With such adorable yet practical natural assets, one might wonder why he wears a neck-warmer at all. It's not to keep out the cold, I can tell you that much! His white-tassled, red and green scarf is purely a fashion statement, bringing out the colors in his holly, setting off his gold eyes, and enhancing the festive spirit of his look. The Christmas Kau takes a completely different approach to winter wardrobe. He's styled himself as a Raindorf--and a very special Raindorf at that. While others are laughing and playing games (like Snow Wars! 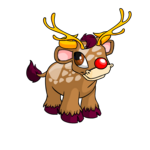 ), he'll be delivering Christmas cheer and presents to pets all over Neopia, his shiny red bulb of a nose leading the way. And he leads the way in Raindorf fashion as well with his dappled brown coat, dark brown hoof and hair accents, and golden antlers masking golden horns. Is there anyone who could possibly look into those big, brown, Kau eyes and not be overwhelmed by cuteness? 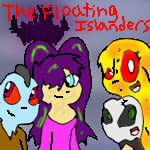 This look is sure to go down in Neopets history! While Santa costumes appear to be out this year, the same can't be said for a top notch elf costume--and that's just what the Draik gives us! His dark green hue makes the colors on his clothing pop, not to mention those sparkling red eyes. From the fur-trimmed, curled-toe, chic, red boots to the fur-trimmed, jingle bell-adorned, striped, red and yellow hat, his wardrobe is festive and fabulous. But he doesn't stop at accessories; he also sports a gorgeous red robe accented by yellow cuffs, a fun yellow collar, a jingle bell button, and a black belt. With a sprig of holly on the tail for good measure, this elf outfit has it all! 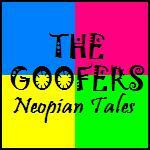 Sometimes jingle bells and bright clothing work, and sometimes Neopia prefers and simple and sleek look. 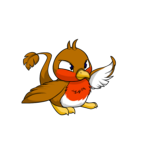 The Christmas Pteri doesn't need fancy footwear or even holly accents to charm users with his festive fashion. If you don't get it, just imagine taking a walk through the woods on a crisp winter's day. The landscape is a blank white dotted by dark trunks as far as you can see, and the sky is a dull grey expanse. A lovely twittering reaches your ears, and you look up to see a Christmas Pteri singing merrily while perched on a bare branch laden with snow. His belly and the underside of his wings are a glistening white, but it's the lovely red of his cheeks and chest (enriched by the warm, cinnamon-colored feathers surrounding them) that stops your heart. He is a symbol of the hope and cheer of the holiday season in a bleak winter landscape--and the best part is his look is versatile enough to work all year long! What is it that gives the holiday season its sparkle? What makes a Christmas tree or neohome shine like a beacon on a dark winter's eve? What does the Christmas Gnorbu have that no other pet on our top ten list has? Christmas lights, of course! 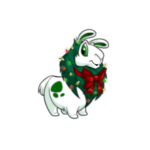 The Gnorbu's red, yellow, and green lights twinkle in a swaying sea of dark green mane (a subtle tribute to a Christmas tree), and his white coat is accented by green spots, green inner ears, and bright green eyes. The look is tied together by a red ribbon collar done into a bow. Don't worry, the "mini" lights are inspected and approved for pet wear as well as weather resistance. Still, it's a good idea to always turn your pet off before going to bed at night. Whether you're out Christmas caroling or just doing some last minute shopping, you just can't go wrong with a fur coat when it comes to winter style. 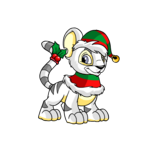 Like many Christmas pets, the Kougra wears white, but he accents his fur coat with silver stripes and a creamy underbelly, pads, eye patches, and inner ears. His jingle bell-tipped, fur-trimmed, red-and-green-striped hat sits mischievously over one large ear. It is accompanied by a matching fur-trimmed collar, which serves both to keep his neck toasty and to step his wardrobe up a notch style-wise. His silver-blue eyes don't distract from his Christmas-colored wardrobe, and his look is finished by the classic holly sprig on the tail. This is one festive feline! The Christmas Uni is pure joy to behold with his snow-white coat and carefully-placed, colored accents. His mane has been painstakingly dyed red and green and styled to perfection to give a fresh, festive feel to his look. The same goes for his poinsettia-red tail. The golden horn on his head balances the gold of his hooves, and the deep blue of his eyes remind one of the dark blue of a silent winter night. He has replaced the traditional scarf or ribbon with a merry wreath adorned with a red bow. As he prances and flutters about, it's obvious the chill won't dampen this pet's spirits. No doubt he's ready to show off his style in a Christmas parade! Some pets make a subtle tribute to holiday greenery with a well-placed holly sprig, a holiday wreath, or by stringing a few lights through their manes, but the Christmas JubJub is the only pet that takes winter foliage fashion to the next level by becoming that beloved symbol of the season and of gift-giving--a Christmas tree. 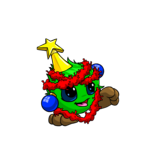 Yes, this is the only Christmas pet to boldly portray everyone's favorite festive flora. His fur is a Fir green, and his feet are tree-trunk brown. His large, round eyes are blue to blend in with the blue ornaments adorning his head. He is also decorated with a red garland and, of course, and beautiful star topper in shining gold. All that's missing are the presents under the tree, which you'll be sure to supply as soon as you adopt one of these pets for your own home. 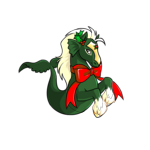 Our second place pet is the elegant Christmas Peophin. This pet foregoes the classic white coat for a pine green one, and instead uses white to color his soft mane, eye patches, and shaggy feet. Instead of a holly sprig on the tail, he places his behind his ear so that the red in the holly berries brings out the red in the jewel on his golden face plate. The bright red is echoed in the finishing touch: a long red ribbon tied into a bow around his slender neck. A hidden layer of blubber keeps him warm in icy winter waters as he brings holiday cheer to all who are fortunate enough to see him swim by. Soaring high above the rest on angelic white wings is the beautiful Christmas Zafara! 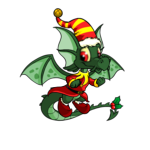 The Zafara is the only pet to dress as a Christmas angel, and Neopets users are enchanted by his unique ensemble. Innocent blue eyes shine out from his saintly face, and his coat is that ever-popular winter color: pure, snow white. Glorious gold accents are added by his belly fur, the spikes along his back, the spots on his ears, and the end of his tail. Of course, no angel outfit would be complete without a golden halo to proclaim his virtuosity. 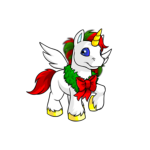 Whether perching atop a Christmas tree, singing a joyous melody, or watching over the poor and downtrodden, this angel is a sign of hope, goodwill, and love for all of Neopia during the holiday season. Pious and popular--what a combination! Here's hoping these festive fashionistas got you into the holiday spirit (or at least made you appreciate that Christmas Paint Brush that's been sitting around in your safety deposit box since the Y9 Advent Calendar). As you nibble on the last of the Christmas cookies before heading off to sink into your nice warm bed and dream of sugar plums, don't forget to stop by Serbris's petpage to find out how you can participate in the next "Paint Brush Polls" article. A sincere thanks goes out to everyone who made the current article possible by submitting their votes and comments. Merry Christmas, happy holidays, and a happy New Year to all (and to all a good night)!